I don't know how my weekend is going to go, but for now it looks like I'm going to be pretty busy. Mom's floor is getting replaced and we are going to do some shopping for more home improvement stuff for her house. Somewhere in there I hope to see The Hunger Games, but I doubt I'll have a lot of time for much else. That doesn't mean I can't dream, though. So, here (in no particular order) is a list of things I want to do this weekend and can't. 1) Fly to Europe. I haven't been back to Europe since I moved away in the 80s. It's changed so much and it might be a huge disappointment to see it as it is now, but I don't care. I want to smell the smells, taste the tastes and see the sights again. 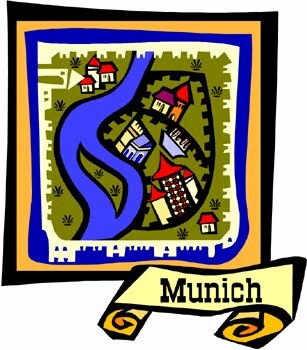 I wouldn't be able to see all of Europe in a weekend, so I'd limit my trip to Munich. It's a beautiful time to go back, too, with temperatures in the 60s during the day and the 30s at night. Mmmm... I want Wiener Schnitzel and Spaetzle! 2) Sleep, read and sleep some more. I just can't seem to get caught up on my sleep. I'm on new meds for migraines and muscle relaxants for my neck so you'd think I'd be snoring all night. Instead I barely sleep and I'm dragging all day. I would love to just curl up in bed with the dogs and a book and read and sleep until Monday. 3) Go to the beach. It doesn't have to be a fancy beach with hot water or anything. I'd settle for taking the dogs to the dog beach at Quiet Waters. Harley likes the smells and Scooter goes crazy for the water. I don't know how Pixie would react, she's never been to the beach. She'll probably pee a lot, but that's par for the course with her. Unfortunately, it's supposed to rain most of the weekend. 4) Cheat on my diet. 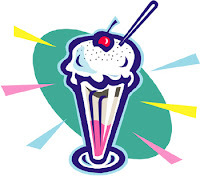 I am up a few pounds so this is a terrible idea, but I would love to have a peanut butter cup sundae from Bruster's. A banana split sounds good about now, too. I just realized this is the second food-related wish on this list. Maybe I should go eat something? 5) Lock myself in my craft room and play all day. I know I do this all the time, but it still consistently makes my top 5 preferred activities. Maybe someday it will drop down the list, but for now it's right up there. I don't know how it will turn out, but I hope to find something fun to do this weekend. How about you? Do you have any fun plans? Want some company?